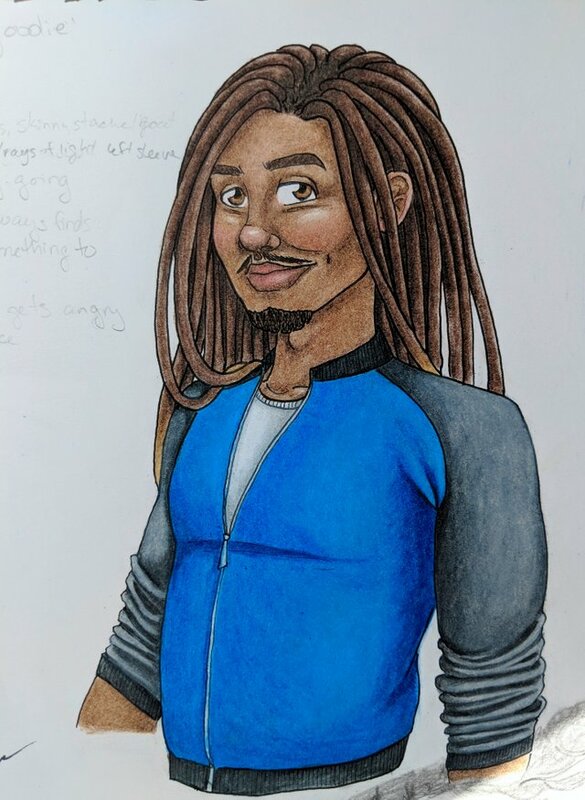 Now that I’m working on getting back into a routine, I decided it was time to get back to working on my comic book preparations… and that means working on more character studies! So I spent some of my “spare time” last week working on this page. 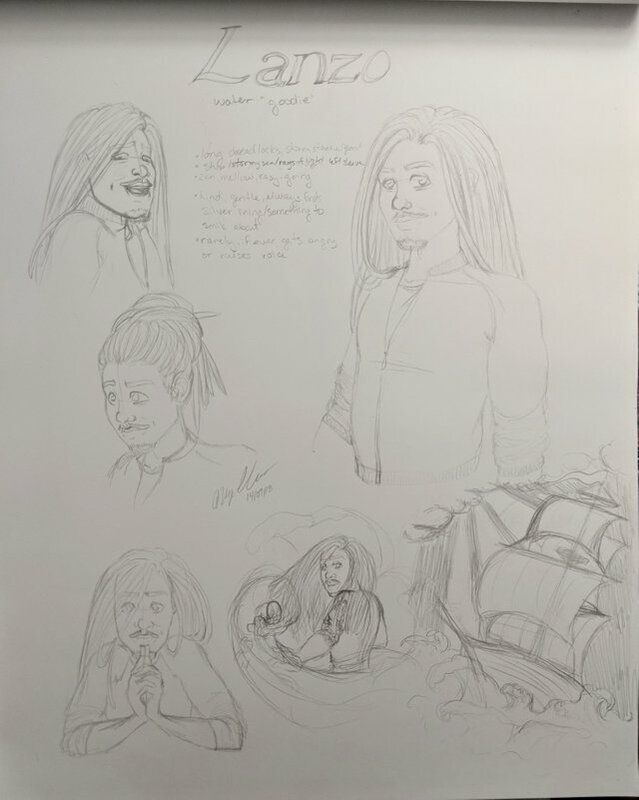 I’d been struggling with redesigning this character for a while, but when I sat down in front of my sketch pad on Friday, this all started flowing out rather seamlessly. 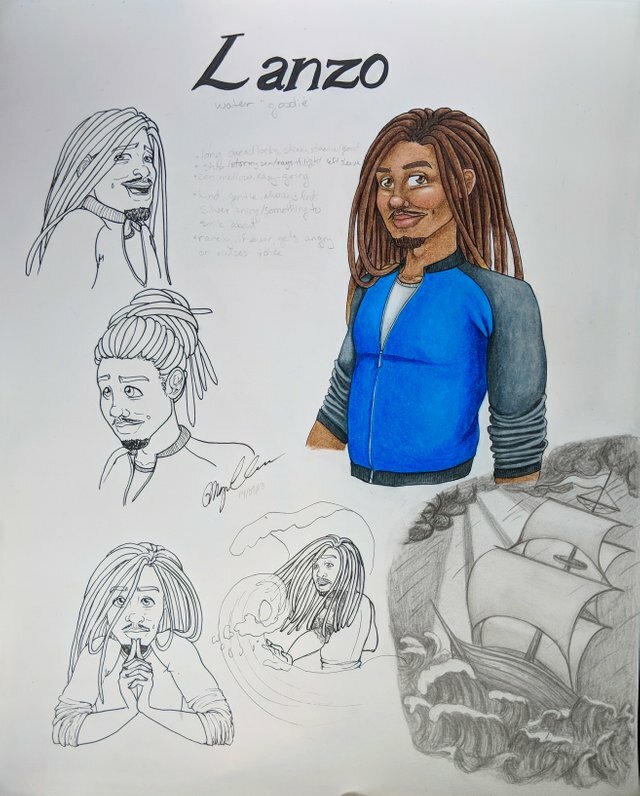 Meet the “goodie” water elemental, Lanzo! 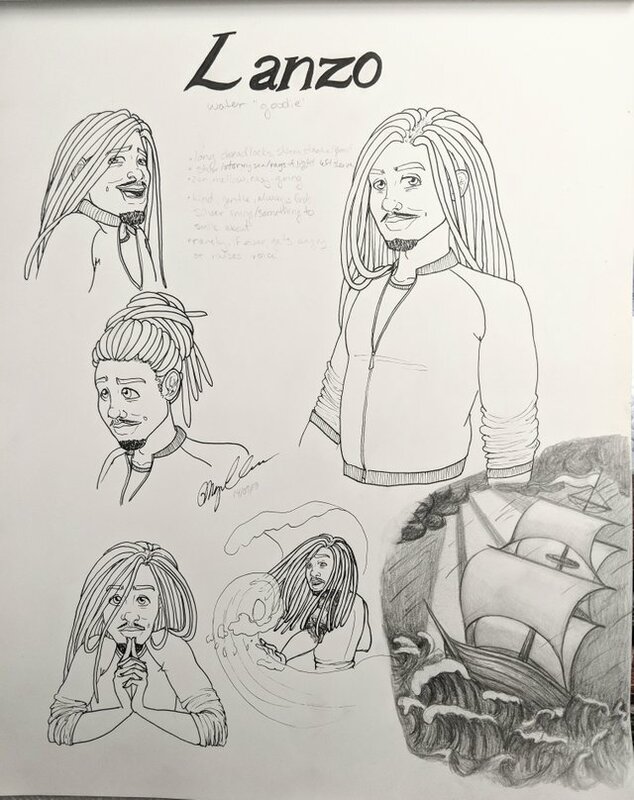 I wrote out a brief description about him on the page, which I will type here, in case it’s too small/faint to read. I inked the outline the same day, then spent a bit of time coloring in the larger drawing on Sat. 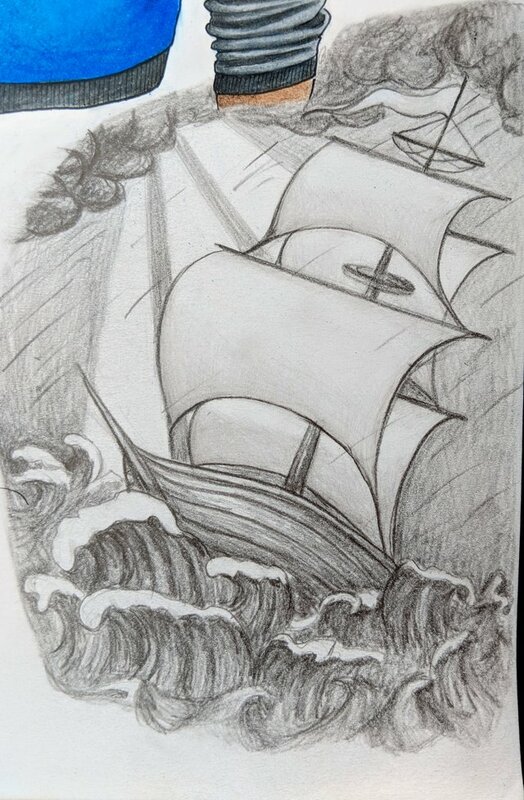 The tattoo design in the bottom corner (which I shaded using various soft and hard pencils) could use a little more refining (especially the clouds), but I’m pleased with it overall, as it definitely gives the overall gist of what I was going for. It is essentially his personality in pictorial form; always finding some ray of light, even on the darkest of days. Ohhh I love this character study. It's so great that you drew him with different expression and also the ship on his left sleeve in details. I am always happy when a creator takes good care of their characters well because such preparation will carry over to the final product. Well done Megan :D.
What a great work! I like your character! You did such a lovely job with his eyes! And those dreadlocks! I'm in love with him! Can't wait to see the whole comic! Thank you! 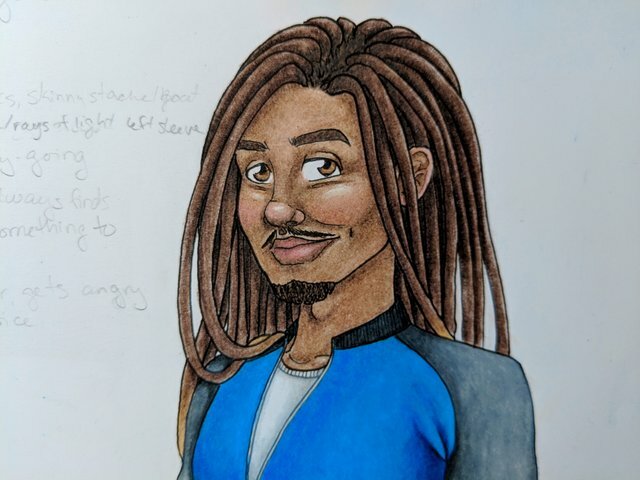 I had a lot of fun drawing his dreadlocks... I’ve always been a fan. 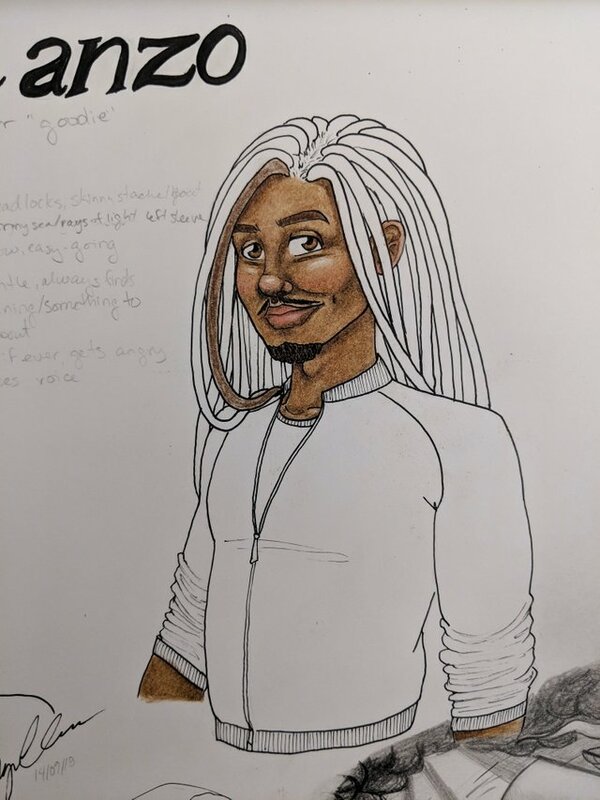 I have a few more character studies to do, but most of them don’t come in until later, so hopefully I won’t have to drag it out too much longer, and I’ll be able to start working on the actual comic soon! Aaah what a nice character study, @offbeatbroad ! Love the thoughts and detailing that went into preparing for your comic book ! Very respect ! I was just saying to another steemian that I sort of lost them for a bit, the same with you. It's the downfall of old school manual curation where I do it myself each day so sometimes people get lost in the mix. I love this fellow and it's fun to do character studies isn't it! I'm always toying with a comic, just keeping the idea in the edge of my mind wondering if and when I'd do it. Have fun! Oh, yes, I took an extended hiatus during the summer because we were doing a lot of travelling, and had quite limited internet access, so I’m just getting back into things now. I’m happy to say it seems I’ve kept my place, though, as I’m able to pick right back up with a lot of folks. Love this community! Thank you! I am having quite a bit of fun with these studies, stretching my creative muscles. There’s so much work that goes into a comic but I think it’s pretty rewarding at the same time. You could always tinker with bits and pieces of development on the side, here and there, develop characters and a basic storyline over time. I will. When did you start listening? Did you change your name.